Children don't automatically know what to do or how to act during meal time. Table manners, like any other skill, need to be modeled and taught. 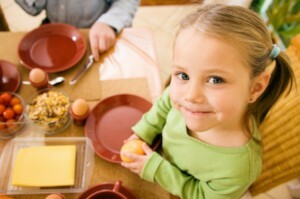 Helping your child master table manners will not only make meal times more pleasant, it will also reinforce the idea that sharing a meal together is special time for staying close and reconnecting. 1. Be patient. Don't expect too much, too soon. Table manners take practice. Avoid subjecting your child to a crash course in table manners the day before a big holiday dinner. Instead, do a little bit every day to reinforce good manners. 2. Model good manners. Children may not understand the "why" of manners, but by watching an adult or older sibling say "thank you" when food is offered, they will start to see that good table manners create positive responses. 4. Praise their efforts. Focus on what your child is doing right instead of picking on the skills they haven't yet mastered. Use specific examples in your praise such as, "I really like how you said 'please and thank you' when you asked your brother for more mashed potatoes." 5. Success breeds success. When children learn table manners without undue pressure from adults, they gain a sense of pride in the skills they've mastered. This pride in turn empowers them to advance from imitating to using and owning their manners. Get tips about family-style dining and how to address concerns about picky eating.